"It is almost certain in my opinion that a very great cataclysm or catastrophe occurred by which the mammoth and his companions were overwhelmed over a very large part of the earth's surface. And that the same catastrophe was accompanied by a very great and sudden change of climate in Siberia, by which the animals which had previously lived in fairly temperate conditions were frozen . . . and were never once thawed until the day of their discovery. No other theory will explain the perfect preservation of these great elephants." A theory presented by Columbia University Professors Walter Pittman and William Ryan connects hundreds of Great Flood legends worldwide to the collapse of an earthen dam across the Bosporus Strait. Situated near the Black Sea, the mega-disaster occurred around 5,600 B.C., according to the two geologists. 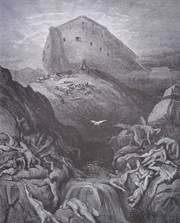 In their book, Noah's Flood, they explain not only how this mega-catastrophe happened, but how exit routes taken by the survivors would eventually produce the many versions of the story handed down to the present day. Here's what they think happened: When the last great ice age initially began thawing out 20,000 years ago, melting glaciers caused the oceans to rise. The higher sea levels allowed the Black Sea to connect with the Sea of Marmara, the Aegean and Mediterranean Seas. That waterway would become the Bosporus Strait. The Bosporus Strait connects the Black Sea (top of photo) and the Sea of Marmara. The city of Istanbul can be seen on either side. The earthen dam formed much later, after sea levels had receded again. A pile of mud and debris blocked water from the Sea of Marmara from reaching the Black Sea, causing the latter to shrink down to the size of a lake. That left many square miles of good farmland available. As a consequent huge migrations brought Neolithic people into what was then the Black Sea basin. Between Greece and Turkey lies the Aegean Sea. The tiny body of water just above that is the Sea of Marmara. Map: PBS. When another period of climate instability settled in around 7,500 years ago, the water level rose again, causing the dam to burst and quickly inundate the basin. Pittman and Ryan contend that this is the catastrophe described in the biblical tale of Noah's ark, the Sumerican Epic of Gilgamesh and other stories. It's an interesting hypothesis. However, it doesn't explain why an ark had to be built or why the planet was pounded with 40 days of rain. Nor does it account for the period of intense cold mentioned by numerous flood legends from India and elsewhere. Other experts have weighed in with their own theories about what caused the Great Flood. Glaciologist Lonnie Thompson used data he collected from ice cores nearer the Equator to deduce that a mass extinction event took place 5,200 years ago, or about 3100 B.C. In Lawrence Joseph's 2007 book, Apocalypse 2012, Thompson reports that a steep drop in global temperatures was followed by an intense period of warming triggered by unusually large corona mass ejections from the Sun. Then there's the work Holocene Impact Working Group, which blames the Great Flood on a comet that struck the Indian Ocean around 2800 B.C. The impact generated mega-fires, tsunamis, and a subsequent volcanic winter that wiped out 80 percent of the human race. These scientists hypothesize that large pieces of the comet hit the eastern Pacific Ocean near the Equator, and also much farther northwest. Corroborating their thesis, Marie-Agnes Courty of the European Center for Prehistoric Research suggests that space particles found in soil samples from different locations around the planet confirm that an asteroid or comet came down from the sky 4,800 years ago. The Holocene Group also uncovered an uexpectedly high dose of iron, nickel and chromium in many sea fossils. This underscores the impact theory and appears to jive more closely with Great Flood myths. Five thousand years before the Holocene comet, a similar scenario may have played out in North America. Around 10000 B.C. a sprawling population of hunter-gathers occuping much of the United States perished in a massive geologic cataclsym. They were called the Clovis people, after their famous spear point unearthed in 1929 near Clovis, New Mexico. For over a century, archaeologists have searched for a cause of the extinction. (About 80 percent of the mega-fauna on the continent also diappeared, including saber-toothed tigers, horses, camels and mastodons.) Some independent researchers attribute the extinction to a shift of the Earth's entire crust. Others, like phycisist Paul LaViolette, blame a cosmic shockwave of radiation that hurled outward from the center of the Milky Way. Today, however, a growing consensus among experts leans toward the comet strike theory -- specifically an impact on the Laurentide Ice Sheet, above the Great Lakes. The event seems to have generated a huge conflagration encompassing thousands of square miles, followed by catrastrophic flooding and (eventually) the onset of the Younger Dryas ice age. Of all the puzzling fallout associated with this episode, none is more bizarre than the graveyard of woolly mammoths and other large animals left behind along the Arctic Circle. Many of the hundreds of thousands of carcasses were found with undigested, warm weather foliage in their stomachs. How could that be, given their polar location? Geologists have traditionally blamed a sudden climate shift for the disappearance of all the large mammals in North America. A period of intense cold hit within the geologic wink of an eye, reversing a period of global warming. The sudden temperature drop triggered arid conditions that caused massive dust storms in the Eastern United States. The combined effect of these changes left both people and animals without enough food to survive. Bolstering the conclusion, in January 2009 a study from the University of Bristol argued that a five-degree hike in global temperatures spawned mega-wildfires in North America and Europe. That would explain the ash layer excavated at numerous Clovis sites. 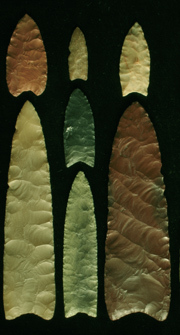 Clovis spear points are an American invention but may have been adapted from older, Solutrean stones that were fashioned in Europe during an older ice age around 20000 B.C. Archaeologists are confounded by this connection, since it suggests that Europeans crossed the Atlantic long before the Vikings. Yet in analyzing disgarded spearheads around the country and Canada, geophycisist Allen West uncovered a pattern of iron fragments embedded into the weapon's top side. He later found nano-diamonds and fullerites (both of apparent extraterrestrial origin) in the Clovis layer of excavations. That provided him with a smoking gun. West's research is featured in the History Channel 2008 documentary Journey to 10000 B.C. He's also a co-author of The Cycle of Cosmic Catastrophes: How a Stone-Age Comet Changed the Course of World Culture, which lays out his theory in detail. A docu-drama premiering more recently on the Science Channel, Super Comet: After the Impact, offers other tantalizing clues to solving the Clovis mystery. For instance, whether it hits on land or sea, a comet's force is sufficient to send a fireball a thousand miles in every direction. The impact crater itself shoots so much smashed and heated rock into the atmosphere that temperatures worldwide can jump up to 700 degrees farenheit. That would ignite forests and melt glaciers in a heartbeat. That data seems to fit the forensics of the Clovis period. Scientists likewise believe the dinosaur extinction of 65 million years ago was caused by a comet of massive proportions that struck the waters off the Yucatan Peninsula. In both cases, only those creatures taking cover underground (reptiles and small mammals), in a cave (bats and humans), or beneath the sea would have survived the disaster. The 10000 B.C. impact also coincided with a huge volume of liquid released by the Laurentide Ice Sheet. Rushing down through St. Lawrence River, all that fresh water desalinated the sea enough to bring the Gulf Stream's warm-water conveyor ( aka the thermohaline circulation) to a halt. This triggered freezing temperatures in the northern Atlantic, kick-starting the Younger Dryas period of geologic hstory. This is the last ice age that preceded the Holocene period, which we are living in today. For a discussion of how thermohaline circulation works, see "Geologic Upheaval on Tap". "Was a Giant Comet Responsible for a North American Catastrophe in 11,000 BC?" Science Daily 4/1/10. "Exploding Asteroid Theory Strengthened By New Evidence." Science Daily 7/3/08. "Major Climate Change Occurred 5,200 Years Ago." Ohio State University news release 12/15/04. "The truth behind Noah's Flood. "By Jacqueline S. Mitchell. PBS. "Geologists Link Black Sea Deluge to Farming's Rise," New York Times, 12/17/96. "'Noah's Flood' Not Rooted in Reality, After All?" National Geographic News 2/6/09. "Chevron-shaped Accumulations Along the Coastlines of Australia as Potential Tsunami Evidences? ", Science of Tsunami Hazards, 2003. "Meteor 'misfits' find proof in sea." New York Times News Service 11/14/06. "Ice Age Ends Smashingly: Did a comet blow up over eastern Canada?" Science News 5/30/07. Note: Requires paid subscription. "Comet impact theory disproved." University of Bristol January 2009. "Texas find suggests early-human camp over 15,000 years old." By Roy Wenzl. AZCentral.com 3/25/11. Noah's Flood: The New Scientific Discoveries About The Event That Changed History. (1997) By Walter Pitman and William Ryan. A History of the End of the World (2006) by Jonathan Kirsch. Earth's Shifting Crust (1955), Paths of the Pole (1958) and Maps of the Ancient Sea Kings: Evidence of advanced civilization in the Ice Age by Charles Hapgood. When the Sky Fell: In Search of Atlantis (1995) by Rand and Rose Flem-Ath. The Orion Prophecy (2001) by Patrick Geryl and Gino Ratinckx. DVD - NOVA: America's Stone Age Explorers. (2004) Research into the origins of the Clovis people, circa 15000 - 11500 B.C.